Hiya, fairy tale-loving peeps! 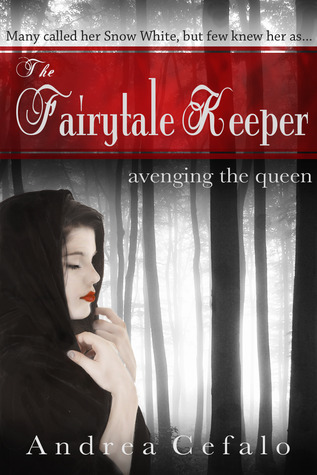 Please join me in welcoming Andrea Cefalo, author of the upcoming The Fairytale Keeper: Avenging the Queen to Fairy Tale Fortnight! Andrea has popped by for a quickie interview. She's also graciously offered up a copy of The Fairytale Keeper as a giveaway, so make sure to go enter - but first, check out her interview below! The Fairytale Keeper presumes that all Grimm’s Fairytales come from one girl, a spitfire cobbler’s apprentice who will 1 day be Snow White. It’s hard to pick one, but if I had to, I would choose Rapunzel. It is such a beautiful love story. I don’t think many people know the Grimm Brothers’ version of the Cinderella story. It’s much darker than the romantic retelling we are all familiar with. I don’t think any of them are overrated. I love them all and I want to include as many of them as I can in The Fairytale Keeper series. If I was a fairy tale villain my name would be Tornade Noire. It’s French for black tornado, a nickname my parents gave me when I was younger. No nook or crannie in a clean house is ever safe, poor Nancy thought to herself. Just then she heard a rumbling in the distance and knew Tornade Noire was moments from her door. Ideally, I like to be sitting in a dark room by a warm fire in a chaise lounge with a down-alternative blanket. I would really want to cast Adelaide myself. I think Maisie Williams, who plays Arya Stark in The Game of Thrones, would be a good fit though she’d have to a bit older. She has that spitfire quality that’s necessary and her face is very expressive which would be important because Adelaide really wears her heart on her sleeve. As for the rest of you, make sure to put The Fairytale Keeper on your to-read list, and stop by my giveaway for a chance to win a copy! You can find Andrea on her website, where you can read the first chapter of The Fairytale Keeper. This is why I love FTF I learn about new books I'd never hear of otherwise! I love how in the original Cinderella the steps cut off portions of their feet SO nasty but SO cool! Hi Kris! My parent's gave me that not-so-flattering nickname because I was an expert at mess-making. No room was safe from my hordes of toys and art supplies! Thanks so much for the interview. I'm looking forward to release day.